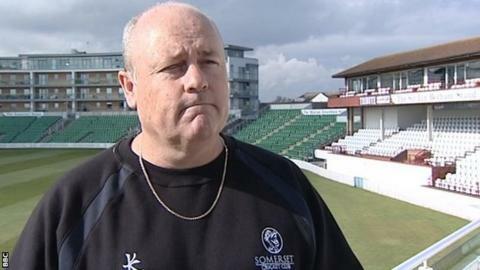 Somerset have announced that director of cricket Dave Nosworthy is to step down at the end of the season. The 46-year-old South African arrived at the end of 2012, replacing Brian Rose, and was due to stay until 2015. Last season Nosworthy led Somerset, who have never won the County Championship, to sixth in Division One. Where did it go wrong for Nosworthy? BBC Somerset commentator and former wicketkeeper Steve Snell, speaking to BBC Radio Bristol:"It doesn't seem to have been a particularly happy camp over the last couple of seasons and unfortunately it seems as though Mr Nosworthy's time has come. You could argue that he has not been given enough time to do his work. On the other hand, you may feel that enough is enough. Director of cricket at Somerset is an extremely attractive proposition and everyone is going to be very keen to throw their hat into the ring." He told the club website: "I believe the time is now right for me to return home with my family for a number of personal and business reasons." This year, Somerset were eliminated at the group stage of both the T20 Blast and One-Day Cup, and have won four, drawn seven and lost two of their 13 County Championship fixtures so far. "I believe I have done as much as I can and the time is right to step aside," continued Nosworthy. "I've really enjoyed my time at the club and it will always have a special place in my heart." Chief executive Guy Lavender added: "Both the club and Dave have mutually agreed that it is in the best interests of Somerset County Cricket Club to part company at the end of this season. "The process of recruiting Dave's successor is underway and an announcement will be made in due course."